A big thanks to Gavin Sharp, Michael Verdi, Marco Mucci, Matt Brubeck, and Asa Dotzler for helping get the What's New page live for Windows 8 users on very short notice. You rock. MAKER PARTY: Manchester, United Kingdom: Arduino Manchester is a group of Arduino enthusiasts who come together to discuss and show the latest innovations and techniques with Arduinos. This session will feature Rebecca Toop, a Visual Anthropology student at the University of Manchester, who will discuss her "use of open source hardware such as Arduino and Raspberry Pi in the Indian cultural context. This involved exploring how the DIY movement and maker spaces contributed to innovation, how people collaborated in design, and the different projects that came out of it." MAKER PARTY: Manchester, United Kingdom: 3D Printing Network Manchester is a group of 3D printer enthusiasts who come together to discuss and show the latest innovations and techniques of 3D printers. MAKER PARTY: Mountain View, CA: Six week, six session Coder Dojo Silicon Valley mini series will teach how to create websites, for mobile, and Python programming. MAKER PARTY: Newcastle, United Kingdom: Think Big Schools will reach 50,000 young people across Europe, between 14-18 years old, over the next three years. The programme provides young people a new type of work experience based on practical business and digital skills, run by O2 employees on O2 sites (or associated ones). MAKER PARTY: Brooklyn, NY: Short-form Video Techniques for PC will teach smartphone or tablet owners, you don’t need an expensive camera or fancy audio equipment to produce an engaging video. In this two-hour session, learn to use your mobile device to make compelling short-form videos—and how to show them to the world on YouTube, Vimeo and more. MAKER PARTY: London, United Kingdom: DIY Electro Synth: Make sweet music with your own Electronic Synth will allow participants to use basic circuitry to create an amazing DIY electronic synth to make sweet music. Participants will get a great introduction to electronics and the components that make up most of the technology in our lives. MAKER PARTY: Brooklyn, NY: Teens - Makerspace Wednesdays: Tech Edition will allow youth to work on Maker projects like 3D printing and Lego Robotics in the Info Commons Training Lab. MAKER PARTY: Manchester, United Kingdom: NSManchester meeting will feature a talk on hacking the Pebble E-Paper watch. MAKER PARTY: Brooklyn, NY: DIY Design Assistance will teach useful tools in Adobe Photoshop, InDesign and Illustrator. Sina Zekavat, a recent graduate in Architecture and Urban Studies from London, will be available to give you advice on how best to use the Adobe package to represent your ideas. MAKER PARTY: Dhaka Division, Bangladesh: Intro to Web will teach students of AIUB, and some Student Ambassadors, an introduction to using and creating the web. MAKER PARTY: Toronto, Canada: Remix the City Workshop - Malvern is a photo-walk brought up to date with a new generation of mobile devices, which have the power to enable the youth to capture and tell the stories that matter to them using their favourite language: short online video clips. MAKER PARTY: London, United Kingdom: Code_in a Day is the starting point for anyone seeking to understand digital concepts. The day is designed around a brief: design, build and launch a multi-platform campaign that encourages and rewards customer loyalty. MAKER PARTY: Kent, United Kingdom: TechTeen Kent events are highly interactive experiences designed to inspire young teenagers and their teachers about careers in the contemporary world of Science, Engineering and Technology. Each TeenTech event gives Y8/ Y9 students and teachers the opportunity to try their hand at experiments, to handle leading edge technology and, most importantly to spend time with the Engineers, Technologists and Scientists influencing their 21st century lives. MAKER PARTY: Toronto, ON, Canada: Three-Day U of T Hacks event should be one of the largest student based hackathons in Canada. We've invited students from all across Canada and the US to come and hack together. We will also have educational talks, seminars and demos. MAKER PARTY: Tamil Nadu, India: Netfire will teach participants to build static and dynamic website for personal and business purposes. MAKER PARTY: Brooklyn, NY: Drawing Basics with Adobe Illustrator will teach the basics of drawing with Adobe Illustrator CS6, the industry-standard vector graphics software, used by designers of all types who want to create digital graphics, illustrations, and typography. MAKER PARTY: Brooklyn, NY: NYC Connected Communities: Freestyle Fridays! for Teens will allow students to hang out, do homework, use laptops, play video games and learn about technology. MAKER PARTY: San Francisco, CA: Two-Day Science Hack Day San Francisco is a 48-hour-all-night event that brings together designers, developers, scientists and other geeks in the same physical space for a brief but intense period of collaboration, hacking, and building ‘cool stuff’. MAKER PARTY: Russia, Moscow: MakeUS! : A Maker Party invited Russian youth to participate in a “Hack Jam”-style event at the Moscow American Center focusing on the Popcorn video remixing tool. MAKER PARTY: Maharashtra, India: Hack Jam Powai brings together IIT Bombay and Mumbai University to organize a Hack Jam in S.M.Shetty school in Powai. We will be learning about basics of HTML and CSS and try to ensure they have the maximum fun possible learning this stuff. 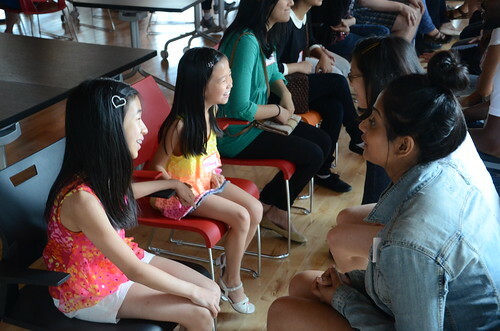 MAKER PARTY: Toronto, Canada: Girls Learning Code: Learn Programming with Ruby! is a workshop for beginners, which will cover essential terms in the Ruby language such as: integers, strings, objects, all while focusing on how an everyday computer operates and understands input. MAKER PARTY: Manchester, United Kingdom: Girl Geek Tea Party #35: Show and Tell is a networking event, talk and hands-on workshops for women and girls with an interest in Science, Technology, Engineering and Mathematics (STEM). MAKER PARTY: London, United Kingdom: Processing and Twitter will teach how to use data from Twitter in Processing. Work with the Twitter API, including getting a developer key. Passing data from Processing to an Arduino Creating more complicated messages to pass more information, and how to understand at the other end what is in those messages. MAKER PARTY: Silver Spring, MD: Silver Spring Mini Maker Faire is a rapid-fire one-day jam, open to anyone and everyone interested in all things game. Are you a coder, artist or audio designer interested in videogame design? Or, are you a gamer who’s curious about how videogames are put together? If so, we’d like to invite you to come join us at Madlab for the next Manchester Game Jam! MAKER PARTY: Manchester, United Kingdom: Manchester Mini Game Jam brings together Makers of all types for a spectacular display of art, science, technology, craft and engineering. This “do-it-yourself” fair invites children and adults to participate in Maker projects and demonstrations, including: Make and race your own lunar Rover with NASA scientists Experiment with 3D printers & vinyl cutters Build a giant marble run Use recycled materials to create new toys Experiment with robotics Make your own computer game And more!! A touch-friendly Firefox for Windows 8 is now live in Aurora. Go get your hands on it and help us test. people learning about web skills, coding and digital making. Learning about Mozilla's mission. Have a look at how much fun people had here. Upcoming Council Elections - 5 candidates - Next: Q&A sessions and townhalls. Version 1.2 is feature frozen. Focus has moved to quality, stability and performance. Schedule for the rest of the 1.2 cycle. Gaia unit/integration test dashboard by the dashing Anthony Ricaud and the swashbuckling James Lal. This page was last modified on 1 October 2014, at 18:01.